How Do You Get Dry Ice from CO2 Gas? CO2 has a long road to travel before it’s the solid pellets or blocks we’re used to seeing. 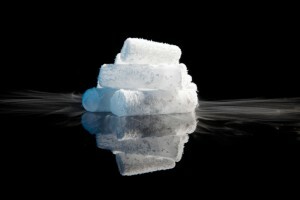 We all know the myriad of amazing things dry ice can do for us. From keeping food fresh during shipment to blast cleaning, mosquito traps to keeping samples at the proper temperatures for research purposes, dry ice is one amazing….Wait, what exactly is it? Let’s find out! Dry ice starts off life as carbon dioxide gas (CO2). From a gas, the CO2 needs to be converted into a liquid before it can become solid dry ice. In order to get the CO2 gas into a liquid, it is pressurized and refrigerated. Once it liquefies, the pressure is reduced causing some of the liquid CO2 to vaporize. As the CO2 vaporizes it causes a rapid decrease in temperature. All of the liquid CO2 that doesn’t evaporate is chilled enough to turn into a snowy substance. Technically, this is dry ice, but not like we’re used to seeing. The dry ice “snow” is compressed, either into pellets or blocks, and then sold to be used for one of the seemingly endless number of uses for dry ice. These blocks or pellets are what you can expect when you purchase dry ice from a supplier. This entry was posted on Friday, July 29th, 2016	at 9:43 AM	and is filed under The Science of Dry Ice	. You can follow any responses to this entry through the RSS 2.0	feed. Both comments and pings are currently closed.